What can you make with rose hip other than rose hip soup? 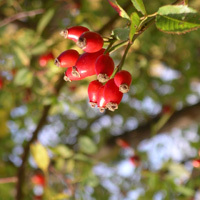 As I was picking the fruit of the thorny rose hip this autumn out on my island I kept wondering whether there was anything else simple – other than the usual rose hip soup – I could do with these fantastic vitamin-C rich fruits of the season. There are so many excellent flavor and health benefits of rose hip that it had to be possible to find other uses for them. While preparing the spicy red cabbage stew (see Paavo’s Danish or Swedish red Christmas cabbage) we were going to enjoy as a vegetable dish with the season’s local lamb and boiled potatoes, it occurred to me that I might try throwing in a few rose hips and see what new flavor experiences might await. Removing the top and and many seeds can be a little bit of a challenge, but if you have some good music or your favorite radio program on in the kitchen, it is just a pleasure. I am happy to report that the flavor addition was outstanding. After this experience, I can heartily recommend that you use rose hip in any one of a number of your autumn stews (vegetarian or not), which you would like to add a tangy flavor element to. Add the rose hip in the last 20 minutes or so of cooking. Simmer gently! Not done with cabbage yet! 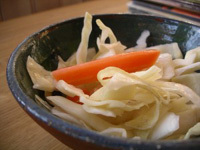 Place the cabbage in a large salad bowl. In a small mixing bowl, blend the liquid ingredients and dill with a manual beater. Pour over the cabbage. Add salt and pepper. Toss, taste, add more salt and pepper if needed. Serve as a healthful and delicious side dish. Last night over dinner I thought I was hallucinating as I watched my 10-year-old son scraping the bottom of the empty cabbage salad bowl. “Mmmm….that was really good Mamma. Is there any more?” My jaw dropped as my daughter added in a complaint that everyone else had hogged the cabbage salad and she’d barely got any. Cabbage isn’t exactly the thing that you expect your 10-year-olds to crave more of. In fact, it isn’t the sort of thing that most people crave more of. However, it is one of those things that all of us should be eating a lot more of. Healthwise, its benefits are second to none, particularly when eaten raw. So, are you going to get your family to devour not only cabbage, but raw cabbage? Let’s take this one step back: how are you going to get yourself enthusiastic about it? Here is a recipe that won’t fail to stir the enthusiasm when served as a side dish or as a base filling in tacos, pita bread or wraps. It is VERY quick to make, VERY simple, VERY inexpensive, VERY good and VERY healthy. You cannot get more VERY! Prepare the cabbage. Mix together the remaining ingredients into a smooth dressing with a manual beater. pour over the cabbage and toss. Done! 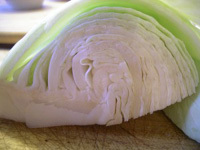 For more great cabbage recipes visit The Nordic Wellbeing Cookbook!